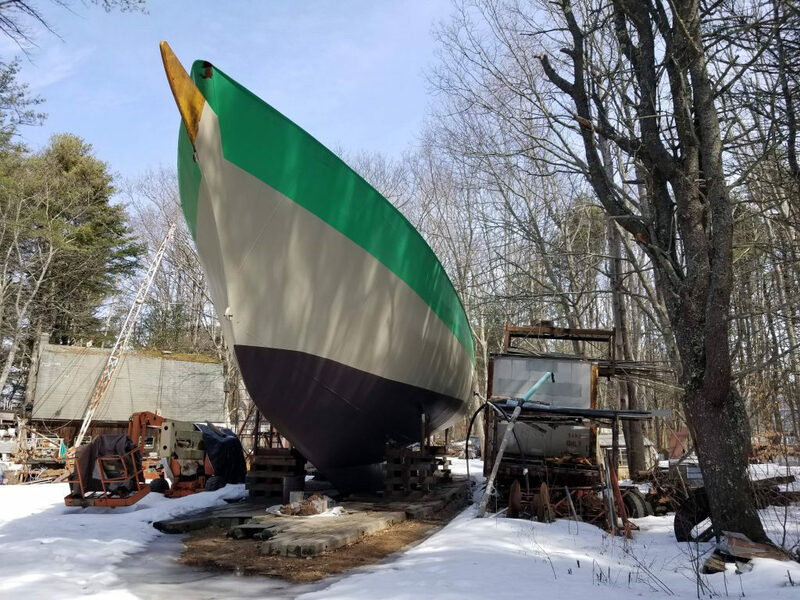 Its owners and the town of Freeport still haven't agreed on the best way to haul the 80-ton, 113-foot schooner to the water. FREEPORT — Everyone involved in the years-long saga of the Island Rover project seems to agree on one thing: The 80-ton, 113-foot topsail schooner belongs in the water. But after years of legal battles, nobody seems to agree on when or how that might happen. Meanwhile, the vessel is sitting on a landlocked parcel on Bucknam Road. After almost 30 years under construction, the Island Rover has been finished, given a fresh coat of paint and certified by the American Bureau of Shipping and American Welding Society. 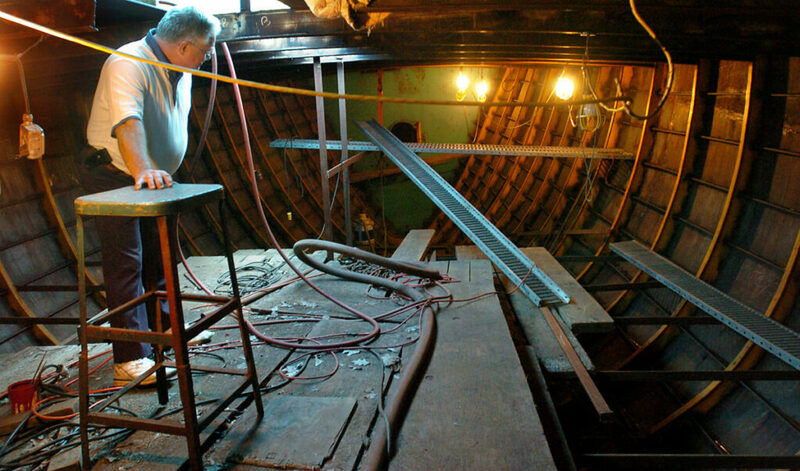 “We did what everybody said was impossible,” said Harold Arndt, the boat’s builder. “It’s always been about the kids,” Arndt said Thursday. It has not been cheap – he’s invested more than “some people pay for a huge motor home,” but with a replacement value of around $1.5 million, it is worth much more than he has put into it. To help fund his venture, Arndt started the Island Rover Foundation in 2001 as a nonprofit, which changed the Rover’s status from a backyard project to a commercial entity. That change also meant the project violated Freeport’s land use rules. The zoning problem first came before the town council in 2004 and again in 2010, when officials extended clemency to Arndt, giving him until the start of 2013 to complete the boat and get it out to sea. The deadline came and went and the Island Rover still was not seaworthy. In 2014, Arndt agreed to the terms of a court order stipulating that the ship had to be removed from the site by fall 2016 – if it were not, he would give the boat title and the foundation’s land over to the town of Freeport, Town Manager Peter Joseph said. The Island Rover was moved a short distance down Bucknam Road, a private right of way which the town contends is still not a conforming location. Justice Thomas Warren ruled the foundation was in violation of a contempt order and was subject to a fine of $500 per day as long as the boat remained in the nonconforming zone. Joseph said that to his knowledge, the boat has not been incurring fees. The foundation was given until August and then November 2017 to launch the boat, pending permit approval, The Times Record reported at the time. It’s been ready to go since then, Arndt said, and would already be out to sea were it not for the town’s intervention, which he sees as unjustified for legal reasons could not elaborate on. However, in 2017 the Freeport Town Council denied an overweight moving permit needed to move the vessel from the property off Flying Point Road, due to concerns over the feasibility and logistics of the launch. Then, in July 2018, Warren ruled that The Island Rover Foundation owed the town of Freeport $36,331 in legal fees. According to Joseph, the money has not yet been paid, but they have “taken steps to secure it” and put liens on the property. Carter Becker, now a 75 percent owner of the ship, was not found in contempt, because he was not part of the original order, but the town has since filed a second suit arguing that the transfer of the boat to Becker violates the original 2014 order. Due to ongoing litigation, Joseph would not comment further. Becker, who also owns Falls Point Marine, which specializes in docks for residential and commercial application, said he was recruited to help get the boat into the water, but was also “pulled in for (his) other expertise,” to help finish the vessel, including welding. Partial ownership of the Island Rover was his payment. Now, it’s up to Carter to get the boat into the water, Arndt said, and the town’s part should be easy. “All they have to say is ‘do it,’ ” he argued, and then “she can get out for the wonderful educational missions with young people” she was meant to do. Arndt envisions opportunities for oceanographic research, as “she was built really strong” and is certified for Arctic ice. Becker, for the most part, is now left with a 75 percent share in a boat he says he never intended to own in the first place. Becker has applied for a Department of Environmental Protection permit to build a ramp on Shore Drive to accommodate the Island Rover for a one-time launch. The first application was denied because it was missing some technical pieces, such as a public notice, according to David Madore, director of communications and education for the DEP. There have been recent meetings and a site visit, Madore said, and, although Becker has not re-submitted his application, he has said he will do so. The 80-ton boat would be about the same size as a tractor-trailer, Becker said, and when it goes down the road it will take up about the same space as two of the trucks side-by-side. Moving it won’t be a problem to Becker – he’s already had a crew move it few hundred yards to the right of way, proving to the town that it is feasible, according to Arndt. Now it only needs to move about 0.4 miles to the shore. Becker is confident he will then be able to sell the boat, ideally to an organization with “bigger pockets” and the motivation to do the educational programming that Arndt always intended. “Bring out your checkbook, it’s all for sale,” he added. Joseph said that the town’s ultimate goal is not to continue legal action, but to get the Island Rover to a conforming location, whether it be in storage, on an appropriate lot or in the water. Doing so would satisfy the 2014 court order, he said.